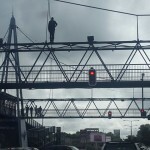 A 28 year old man of Lusaka yesterday stunned the public when he got on top of Manda hill foot bridge in an attempt to commit suicide but his mission was aborted after police officers counselled him and brought him down. 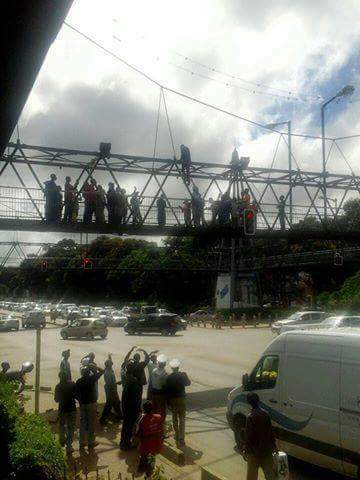 John Lungu of Matero, and believed to be one of the many unemployed youths climbed the bridge top at about 08:00hrs. Some members of the public pleaded with him and offered to give him money but he ignored them. 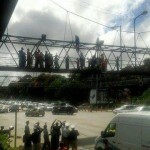 Later police were notified and one of them followed him and managed to convince him to come down while other traffic officers were at hand on the ground to control the flow of traffic. He was later taken to Emmasdale police station where he was further counselled. Police have confirmed the identity of the man. A source further says that Lungu is a graduate from some named college but has never had any formal employment from the time he graduated about seven years ago. Recently, another soldier threatened to commit suicide for not being paid his benefits by the Zambia Army. It took the Army commander to come and plead with him to come down from one of the Lusaka towers he had climbed.